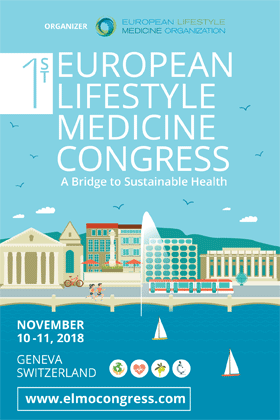 The 1st European Lifestyle Medicine Congress was successfully held in Geneva, 10-11 November 2018 marking a promising beginning in ELMO’s scientific activities. During the two congress days, 22 speakers from 15 countries delivered an excellent scientific program including keynote lectures, round tables and oral presentations. The scientific program, attended by delegates from 32 countries, covered most aspects of Lifestyle Medicine including clinical practice, public health, education and behaviour change, nutrition, environment, mental health, sleep, physical activity and future innovations of lifestyle medicine. PHYSICAL CHANGES AFTER A 12 WEEK DEEP-WATER RUNNING GROUP CLASS PROGRAM FOR BREAST CANCER SURVIVORS WITH MASTECTOMY.